We have some great things happening at the Tree House in the next couple of months. We’ve been a bit quiet on the music front lately, but are very excited that we will have Lucy Anne Sale, Wes Finch, Jez Hellard and others playing in April – not all at once! Though Lucy and Wes are on the same bill. Thanks to all of them for offering to come and play! We have Dr Peter Lockyer coming at the end of March to talk about artist and writer Brenda Chamberlain, whose life and work is fascinating. I am also giving art history talks on Northern Renaissance art – currently on Monday mornings and Thursday evenings. On 8 March, we have Greta Berlin coming to give a talk and sign copies of her book. Greta has been an activist on behalf of the Palestinians for many years, and has much first-hand experience of the situation there. Her book tells her story, and this should be a fascinating event. We have our twice-weekly film club on Saturday evenings and Sunday afternoons – join the mailing list (or Facebook group if you are on Facebook) for regular details of what films we are showing. If you want to take pot luck, Sunday films (mostly old classics and fairly gentle films) are at 3pm, Saturday evening films (bit more eclectic) at 7.30, doors open half an hour before – just turn up! As if all of that were not enough, at the end of April we are putting on a week-long Shakespeare festival, to celebrate the birth of Warwickshire’s greatest son – he’s 450 this year, and still as fresh and meaningful as ever, as one of our speakers, Warwick University scholar Thomasin Bailey, will demonstrate as she considers the question, ‘Why celebrate Shakespeare’s birthday?’ As well as her talk, we have a booksigning with Who Killed William Shakespeare? author Simon Stirling, performances of scenes and sonnets by the Warwick University Shakespeare Society, Elizabethan dance classes with Noël Butler, who has worked as dance instructor and adviser on numerous period dramas, and Shakespeare-based children’s drama workshops with Sam Holley Horseman of Dramalings, her local children’s drama company. We may even have maypole dancing at Abbey End! There will be more besides – films, quizzes and challenges for children (and maybe for adults! ), and maybe things yet to be decided. The week runs from 19-27 April – it has its own Facebook page (publicly accessible) and we will produce flyers in due course with the dates and times of the various events. So do join in with some of these events, it’s all becoming more and more fun as people get to know about us and get involved. We do also sell lots of lovely second-hand books as well! Slight change of plan – and more art history! As ever, my barely existent decision-making skills mean that I have changed my plans slightly from my previous post. We will still have our literary discussion group, but on a Friday rather than Thursdays, and they will alternate with any music events that we have on Friday evenings. Thursdays will now be reserved for art history lectures. I gave some daytime ones before Christmas, which were very successful, and am starting another daytime series on Monday 24th February at 11am – see the Events tab for more details. I will then start evening lectures on Thursday 27th February, repeating the lectures I gave last term, on German Renaissance art. This evening we will just be staying open until 9pm. Nothing is happening, just the shop open, I’ll be pottering around shelving books and doing things, the urn will be on, so if you fancy a civilised place to spend an hour reading or working (we have free wifi), or even to buy a book (radical! ), do drop in. This will happen next week too, and then from the following Thursday we will have lectures, starting at 8pm. While we are not having the film club on Thursdays for a while, I will be experimenting with late night opening instead – and encouraging people to come and discuss books. In a bookshop…radical! One of the purposes in setting up the Tree House was to counteract what I see as an increasing anti-intellectualism in our society. If you proclaim that Thomas Hardy is better than Dan Brown, and more worthwhile as a writer, you are accused of being a snob. If you use words of more than two syllables you are mocked for being clever. If you prefer The Bridge to The Voice as Saturday night viewing, with all those complicated subtitles, you are patronised, even by the BBC, whose remit is to go well beyond pandering to viewing figures and flogging stale programme formulae. There is not a single regular programme about books on the BBC, let alone on other standard channels. This has long shocked me. Radio 4 serves us a little better, and I am deeply grateful (though even A Good Read is not what it was! ), but while we have endless cookery shows, antiques shows, documentaries about all sorts of rubbish, books are given very short shrift. The Beeb should be leading the way. So in our little corner of middle England, my plan was to promote the wonder of books, the importance of literature, the pleasure of reading, the civilising influence of reading, the lifechanging consequences of engaging with the ideas of the intelligent of this and past centuries. 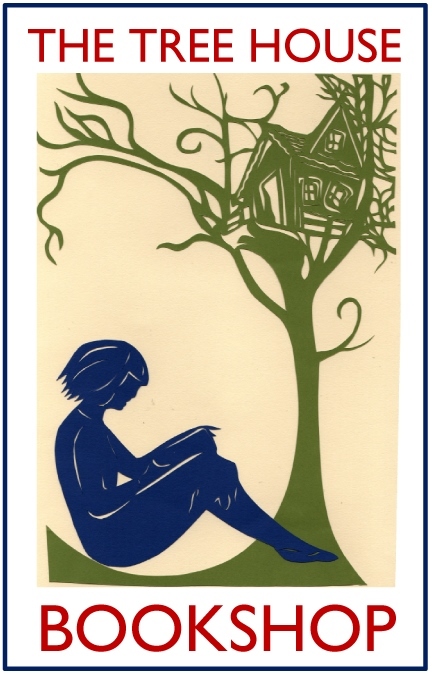 You can read as much Dan Brown as you like, but the Tree House is about much more than that – we want to promote serious engagement with serious literature, and in the desperate attempts simply to keep afloat financially that has been neglected. So Thursday evenings for the next few weeks – maybe indefinitely! – will be set aside for people to come and have a cup of tea and discuss things literary. Not a book group in the usual sense, more a chance to discuss literature, to engage with others who love reading serious books, to think about what books (specific books) tell us and how they tell us what they tell us…and so on. I may occasionally invite speakers along. The shop will be open for general browsing, and the sofa area can be used for those who want to take part in discussions. We will simply stay open, and close at 9 if no one is around, and if people are around, we’ll close when they have had enough. Spread the word! Thursday Salons at the Tree House. Oh yes.